36 FLEX007 MAGAZINE I JULY 2018 • Physical space requirement reduction since parts can be placed, and traces can be routed, in three dimensions • Improved electromechanical functional- ity including dynamic bending, vibration and shock tolerance, heat resistance, and weight reduction Flex and Rigid-Flex Design Challenges In addition to the usual PCB design chal- lenges, flex and flex-rigid PCB designers are faced with a long list of unique challenges that, unless properly managed, can lead to design failures, re-spins, and long-term reliability issues. Let's take a look the key challenges: • Multiple board outlines, each with sepa- rate layer stackups, require proper con- figuration throughout the design process in collaboration with both mechanical and electrical domains. • Special layer stackup constructs for flex and rigid-flex designs vary, requiring the designer to efficiently manage them to ensure they are conveyed for proper fabri- cation. • Bending and the 3D aspect of the folded assembly has its own set of requirements to maximize design reliability, including the need to route along curving boards without causing reliability issues due to metal stress. 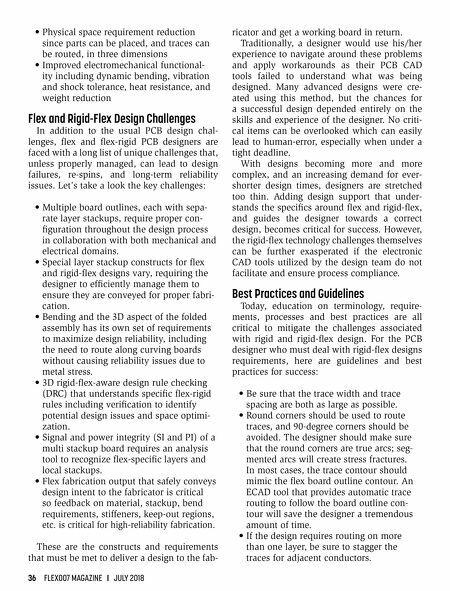 • 3D rigid-flex-aware design rule checking (DRC) that understands specific flex-rigid rules including verification to identify potential design issues and space optimi- zation. • Signal and power integrity (SI and PI) of a multi stackup board requires an analysis tool to recognize flex-specific layers and local stackups. • Flex fabrication output that safely conveys design intent to the fabricator is critical so feedback on material, stackup, bend requirements, stiffeners, keep-out regions, etc. is critical for high-reliability fabrication. These are the constructs and requirements that must be met to deliver a design to the fab- ricator and get a working board in return. Traditionally, a designer would use his/her experience to navigate around these problems and apply workarounds as their PCB CAD tools failed to understand what was being designed. Many advanced designs were cre- ated using this method, but the chances for a successful design depended entirely on the skills and experience of the designer. No criti- cal items can be overlooked which can easily lead to human-error, especially when under a tight deadline. With designs becoming more and more complex, and an increasing demand for ever- shorter design times, designers are stretched too thin. Adding design support that under- stands the specifics around flex and rigid-flex, and guides the designer towards a correct design, becomes critical for success. However, the rigid-flex technology challenges themselves can be further exasperated if the electronic CAD tools utilized by the design team do not facilitate and ensure process compliance. Best Practices and Guidelines Today, education on terminology, require- ments, processes and best practices are all critical to mitigate the challenges associated with rigid and rigid-flex design. 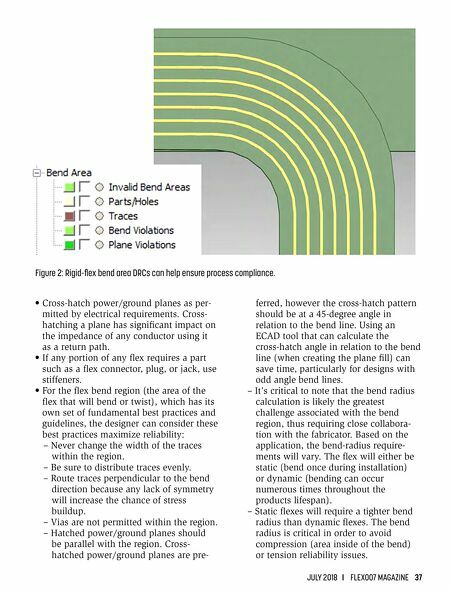 For the PCB designer who must deal with rigid-flex designs requirements, here are guidelines and best practices for success: • Be sure that the trace width and trace spacing are both as large as possible. • Round corners should be used to route traces, and 90-degree corners should be avoided. The designer should make sure that the round corners are true arcs; seg- mented arcs will create stress fractures. In most cases, the trace contour should mimic the flex board outline contour. An ECAD tool that provides automatic trace routing to follow the board outline con- tour will save the designer a tremendous amount of time. • If the design requires routing on more than one layer, be sure to stagger the traces for adjacent conductors.